This is an old revision of this page, as edited by Addbot (talk | contribs) at 00:41, 23 February 2013 (Bot: Migrating 15 interwiki links, now provided by Wikidata on d:q592513 (Report Errors)). The present address (URL) is a permanent link to this revision, which may differ significantly from the current revision. For other uses, see TKS (disambiguation). For the Japanese aircraft, see Teradako-ken TK-3. The TK (TK-3) and TKS were Polish tankettes during the Second World War. 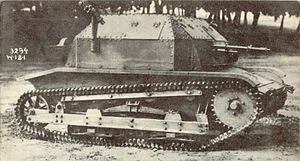 The TK (also known as the TK-3) tankette was a Polish design produced from 1931 that was based upon an improved chassis of the British Carden Loyd tankette. The TKS was an improved model with a new hull and a more powerful engine. The armour of the TK was up to 8 mm thick (10 mm on the TKS). In 1939, re-arming of the tankettes with 38FK 20 mm machine guns began, but only about 24 were completed before the outbreak of World War II. On 6 November 1934 Estonia purchased 6 vehicles from Poland, with the contract deal worth over 180,000 krones. The deal also included one additional tracked-lorry, and a motorcycle was given free as a bonus. The 575 TK/TKS tankettes formed the bulk of the Polish armoured forces before the outbreak of war. They suffered heavy losses during the Invasion of Poland, often being the only armoured fighting vehicles available. Due to their light armament of a single machine gun, they stood no chance in combat against German tanks, except the Panzer I, but their small size suited them for reconnaissance and infantry support. Only the handful of tankettes armed with 20 mm guns had a fighting chance against the enemy tanks; in one instance on 18 September 1939 a 20 mm gunned TKS with Nkm wz.38 FK commanded by Podchorazy or Officer Candidate in the rank of SFC Roman Orlik destroyed three German Panzerkampfwagen 35(t) tanks. TKS with Nkm wz.38 FK - 20 mm gun - about 24 TKS fitted with 20 mm gun in 1939. C2P - unarmoured light artillery tractor, about 200 built. TKD - light self propelled gun with 47 mm gun, four made. TKW - light reconnaissance tank with turret, one prototype made. TK-3 with 20 mm gun - only one prototype with a modified hull was completed. There are only two fully operational TKS tankettes and one TK-3 surviving. All of them reconstructed from wrecks in the first decade of 21st century, using non-original parts. 1 x TKS - One of the TKS tankettes was donated to Poland by the Swedish Axvall Tank Museum and since 2008 it is on exhibition in the Museum of the Polish Army. Interestingly, the Swedish TKS survived the post-war period in Norway, where it was operated by a local farmer as a tractor. 1 x TKS - Private collection. 1 x TK-3 - Private collection. The other survivors are not in working order. 1 x TKS - On exhibition in the Kubinka Tank Museum in Russia. 1 x TKS - On exhibition in the Military Museum in Belgrade. 1 x TKF - In Serbia. 1 x C2P artillery tractor - Was found in Belgium and bought by the National Military History Center of Auburn, Indiana, where it is currently on exhibition. Leszek Komuda, "Przeciwpancerne tankietki" in: "Militaria" Year 1 Nr. 3 and Nr. 4. Adam Jońca, Rajmund Szubański, Jan Tarczyński, "Wrzesień 1939 - Pojazdy Wojska Polskiego - Barwa i broń"; WKL; Warsaw 1990. Jan Tarczyński, K. Barbarski, A. Jońca, "Pojazdy w Wojsku Polskim - Polish Army Vehicles - 1918-1939"; Ajaks; Pruszków 1995. Estonian TKS tankettes on the republic's anniversary parade on 24th of February, 1937. Wikimedia Commons has media related to TKS.